The first tank-landing ships were built[by whom?] to British requirements by converting existing ships; the UK and the US then collaborated upon a joint design. 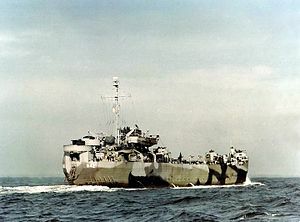 Over 1,000 LSTs were laid down in the United States during World War II for use by the Allies; the United Kingdom and Canada produced eighty more. The British evacuation from Dunkirk in 1940 demonstrated to the Admiralty that the Allies needed relatively large, ocean-going ships that could handle shore-to-shore delivery of tanks and other vehicles in amphibious assaults upon the continent of Europe. As an interim measure, three 4,000- to 4,800-GRT tankers, built to pass over the restrictive bars of Lake Maracaibo, Venezuela, were selected for conversion because of their shallow draft. Bow doors and ramps were added to these ships, which became the first tank landing ships, LST (1): HMS Misoa, Tasajera and Bachaquero. They later proved their worth during the invasion of Algeria in 1942, but their bluff bows made for inadequate speed and pointed out the need for an all-new design incorporating a sleeker hull. The first purpose-built LST design was HMS Boxer. It was a scaled-down design from ideas penned by Prime Minister Winston Churchill. In order that it could carry 13 Churchill infantry tanks, 27 other vehicles and nearly 200 men (in addition to the crew) at a speed of 18 knots, it could not have a shallow draught sufficient for easy unloading. As a result, each of the three (Boxer, Bruiser, and Thruster) ordered in March 1941 had a very long ramp stowed behind the bow doors. The three ships were converted to "Fighter Direction Ships" for the invasion of Normandy. The U.S. were to build seven LST (1) but in light of the problems with the design and progress with the LST Mark II the plans were canceled. Construction of the LST (1)s took until 1943 and the first US LST (2) was launched before them. At their first meeting at the Atlantic conference in Argentia, Newfoundland, in August 1941, President Franklin D. Roosevelt and Prime Minister Winston Churchill confirmed the Admiralty's views. In November 1941, a small delegation from the Admiralty arrived in the United States to pool ideas with the United States Navy's Bureau of Ships with regard to development of ships and the possibility of building further Boxers in the US. During this meeting, it was decided that the Bureau of Ships would design these vessels. As with the standing agreement, these ships would be built by the US so British shipyards could concentrate on building vessels for the Royal Navy. The specifications called for vessels capable of crossing the Atlantic, and the original title given to them was "Atlantic Tank Landing Craft" (Atlantic (T.L.C.)). Calling a vessel 300 ft (91 m) long a "craft" was considered a misnomer and the type was re-christened "Landing Ship, Tank (2)", or "LST (2)". The LST (2) design incorporated elements of the first British LCTs from their designer, Sir Rowland Baker, who was part of the British delegation. One of the elements provided for sufficient buoyancy in the ships' sidewalls so that they would float the ship even when the tank deck was flooded. The LST (2) gave up the speed of HMS Boxer, at only 10 knots, but carried a similar load while drawing only three feet forward when beaching. Within a few days, John C. Niedermair of the Bureau of Ships sketched out an awkward looking ship that proved to be the basic design for the more than 1,000 LST (2) that were built during World War II. To meet the conflicting requirements of deep draft for ocean travel and shallow draft for beaching, the ship was designed with a large ballast system that could be filled for ocean passage and pumped out for beaching operations. An anchor and mechanical winch system also aided in the ship's ability to pull itself off the beach. The rough sketch was sent to Britain on 5 November 1941 and accepted immediately. The Admiralty then requested that the United States build 200 "LST (2)" for the Royal Navy under the terms of lend-lease. The preliminary plans initially called for an LST 280 feet (85 m) in length; but, in January 1942, the Bureau of Ships discarded these drawings in favor of specifications for a ship 290 feet (88 m) long. Within a month, final working plans were developed that further stretched the overall length to 328 feet (100 m) and called for a 50-foot (15 m) beam and a minimum draft of 3.8 feet (1.2 m). This scheme distributed the ship's weight over a greater area, enabling her to ride higher in the water when in landing trim. The LST could carry a 2,100 short tons (1,900 t) load of tanks and vehicles. The larger dimensions also permitted the designers to increase the width of the bow door opening and ramp from 12 to 14 feet (3.7 to 4.3 m) in order for it to be able to accommodate most Allied vehicles. As the dimensions and weight of the LST increased, steel plating thickness increased from 1⁄4-inch (6.4 mm) to 3⁄8-inch (9.5 mm) on the deck and sides, with 1-inch-thick (25 mm) plating under the bow. By January 1942, the first scale model of the LST had been built and was undergoing tests at the David Taylor Model Basin in Washington, D.C. Provisions were made for the satisfactory ventilation of the tank space while the tank motors were running, and an elevator was provided to lower vehicles from the main deck to the tank deck for disembarking. In April 1942 a mock-up of the well-deck of an LST was constructed at Fort Knox, Kentucky to resolve the problem of ventilation within the LST well-deck. The interior of the building was constructed to duplicate all the features found within an actual LST. Being the home to the Armored Force Board, Fort Knox supplied tanks to run on the inside while Naval architects developed a ventilation system capable of evacuating the well-deck of harmful gases. Testing was completed in three months. This historic building remains at Fort Knox today. Early LST operations required overcoming the 18th-century language of the Articles for the Government of the United States Navy: "He who doth suffer his ships to founder on rocks and shoals shall be punished..." There were some tense moments of concept testing at Quonset, Rhode Island, in early 1943 when designer Niedermair encouraged the commanding officer of the first U.S. LST to drive his ship onto the beach at full speed of 10 knots (12 mph; 19 km/h). USS LST-983 with LST-601 in the background, launches a Marine LVTP-5 for a waterborne landing. When carrying amphibious tractors, an LST could land her payload from offshore without beaching. USS LST-325 (left) and USS LST-388 unloading while stranded at low tide during the Normandy Invasion in June 1944. Note: propellers, rudders, and other underwater details of these LSTs; 40 mm single guns; "Danforth" style kedge anchor at LST-325's stern. A GM EMD 12-567ATLP diesel engine as installed in LST 393 (Landing Ship Tank), located in Muskegon, Michigan, July 2017. The engines were rated at 900 HP (each) at 744 RPM. In three separate acts dated 6 February 1942, 26 May 1943, and 17 December 1943, Congress provided the authority for the construction of LSTs along with a host of other auxiliaries, destroyer escorts, and assorted landing craft. The enormous building program quickly gathered momentum. Such a high priority was assigned to the construction of LSTs that the previously laid keel of an aircraft carrier was hastily removed to make room for several LSTs to be built in her place. The keel of the first LST was laid down on 10 June 1942 at Newport News, Virginia, and the first standardized LSTs were floated out of their building dock in October. Twenty-three were in commission by the end of 1942. The LST building program was unique in several respects. As soon as the basic design had been developed, contracts were let and construction was commenced in quantity before the completion of a test vessel. Preliminary orders were rushed out verbally or by telegrams, telephone, and air mail letters. The ordering of certain materials actually preceded the completion of design work. While many heavy equipment items, such as main propulsion machinery, were furnished directly by the Navy, the balance of the procurement was handled centrally by the Material Coordinating Agency—an adjunct of the Bureau of Ships—so that the numerous builders in the program would not have to bid against one another. Through vigorous follow-up action on materials ordered, the agency made possible the completion of construction schedules in record time. The need for LSTs was urgent, and the program enjoyed a high priority throughout the war. Since most shipbuilding activities were located in coastal yards that were mainly used for construction of large, deep-draft ships, new construction facilities for the LSTs were established along inland waterways, some converted from heavy-industry plants, such as steel fabrication yards. Shifting the vessels was complicated by bridges across waterways, many of which were modified by the Navy to permit passage. A dedicated Navy "Ferry Command" orchestrated the transportation of newly constructed ships to coastal ports for final fitting out. Of the 1,051 LSTs built during the war, 670 were supplied by five "cornfield shipyards" in the Middle West. Dravo Corporation's facility at Neville Island, Pennsylvania, designated the lead shipyard for the project, built 145 vessels and developed fabrication techniques that reduced construction time and costs at all of the LST shipyards. The Missouri Valley Bridge & Iron Co. built the most LSTs of any shipyard, with 171 constructed at Evansville, Indiana. Chicago Bridge and Iron's shipyard in Seneca, Illinois, launched 156 ships and was specifically chosen because of their reputation and skills, particularly in welding. The American Bridge Company in Ambridge, Pennsylvania, built 119. By 1943, the construction time for an LST had been reduced to four months. By the end of the war, this had been cut to two months. Considerable effort was expended to hold the ship's design constant, but, by mid-1943, operating experience led to the incorporation of certain changes in the new ships. The LST-491 class replaced the elevator installed in the original LST-1 class, to transfer equipment between the tank deck and the main deck, with a ramp that was hinged at the main deck. This allowed vehicles to be driven directly from the main deck onto the tank deck and then across the bow ramp to the beach or causeway, speeding the process of disembarkation. 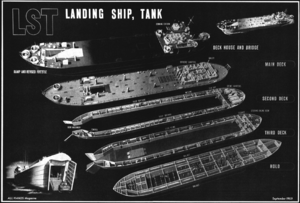 Changes in the later LST-542 class included the addition of a navigation bridge; the installation of a water distillation plant with a capacity of 4,000 gallons per day; the removal of the tank deck ventilator tubes from the center section of the main deck; the strengthening of the main deck in order to carry a smaller Landing Craft Tank (LCT); and an upgrade in armor and armament, with the addition of a 3"/50 caliber gun. The LST (2) design was successful and production extensive, but there was still a need for more LSTs for British operations. As such, it was decided to build a further 80 of the ships in the UK and Canada to be available in the spring of 1945. Carry five Landing Craft Assault (LCA), or similar craft, and one LCT (5) or LCT (6) on the upper deck, in place of transport, and, as an alternative to the LCT (5), two NL pontoon causeway to be carried; the LCT (5) and NL pontoon causeways to be capable of launching directly from the upper deck. To carry 500 tons of military load and to beach with that and sufficient fuel and stores for a 1,000 mi (1,600 km) return journey at 10 knots (19 km/h), on draughts 4 ft 6 in (1.37 m) forward and 11 ft 6 in (3.51 m) aft. Two major problems made a redesign necessary. The preferred light weight medium-speed (locomotive type) Electro-Motive Diesel 12-567 diesel engines were not immediately available. Staff wanted more power and higher speeds if possible, which the EMD engines could have provided. However, the only engines available were very heavy steam reciprocating engines from frigates that had been cancelled. These delivered two and a half times the power of the diesels. So large were they that significant changes had to be made to accommodate them. Lack of welded construction facilities meant that the hull had to be riveted. This combination of heavy hull and heavy engines meant that speed was only 3 knots faster than the LCT (2). At the same time, other improvements were made—as well as simplifications required so most of the structure could be assembled with rivets. The cutaway hard chine that had been dropped in the American version of the Mark 2 vessels was restored. The tank deck, which was above the waterline, was made parallel to the keel, there was to be no round down to the upper deck, and the ship was enlarged to accommodate the more bulky machinery. Provision was made for carrying the British Landing Craft Assault (LCA) in gravity davits, instead of American assault craft. Provision was also made for carrying Landing Craft Tank (LCT) and Landing Craft Mechanized (LCM), and NL pontoon causeways. When the design commenced, engineers knew that the beaches where the ships were expected to land would be very flat, but it was not possible to produce a satisfactory vessel with a 3 ft (0.91 m) draught forward, and very little keel slope, so the 1 in 50 keel slope was maintained. 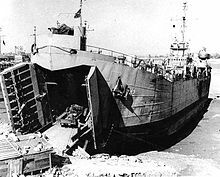 It was known that the 1:50 slope would often result in the LST grounding aft on a shallow beach, resulting in the vehicles being discharged into comparatively deep water. Various methods had been investigated to overcome the problem, but heavy grounding skegs and the N.L. pontoon causeways were finally accepted as standard; the pontoon causeways were formed of pontoons 7 ft (2.1 m) × 5 ft × 5 ft (1.5 m), made up into strings and rafts. When offloading, the rafts were secured to the fore end of the ship, and the load discharged directly onto the shore, or towed on the raft to the shore. The ships were fitted out for service in both very cold and tropical conditions. The accommodation provided for both crew and army personnel was greatly improved compared with LST (2). The main hazard, apart from enemy action, was fire on the tank deck. Fire sprinklers were provided, but the water drenching system installed in later American vessels could not be provided. 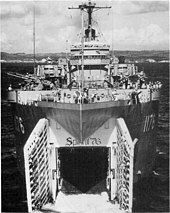 The bow door arrangements were similar to the LST (2), but the design arranged the bow ramp in two parts in an attempt to increase the number of beaches where direct discharge would be possible. The machinery for operating the bow doors and ramp were electrical, but otherwise, steam auxiliaries replaced the electrical gear on the LST (2). The general arrangements of the tank deck were similar, but the design increased headroom and added a ramp to the top deck, as in later LST (2)s. Provision was made for carrying LCA on gravity davits instead of the American built assault boats. The arrangements were generally an improvement over the LST (2), but suffered from a deeper draught, and, to some extent, from the haste of construction. The first orders were placed in December 1943 with British builders, and 35 with Canadian builders. Swan Hunter delivered the first ships in December 1944. During 1944, follow up orders were placed in Canada for a further 36. These programmes were in full swing when the war ended, but not all vessels were completed. The ships were numbered numbers LST-3001 to LST-3045 and LST-3501 to LST-3534. LST−3535 and later were cancelled. Fifteen 40-ton tanks or 27 25-ton tanks could be carried on the tank deck with an additional fourteen lorries on the weather deck. The common stroke was 30 inches (760 mm). The piston and slide valve rods were all fitted with metallic packing to the stuffing boxes, and all pistons fitted with packing rings and springs. The high-pressure valve was of the piston type, whilst the remaining ones were of the balanced type. The main engines were designed to develop 2,750 hp (2,050 kW) at 185 rpm continuously. With the ships being twin screw, the engines were fitted with a shaft coupling to the crank shaft at the forward end, allowing the engine to be turned end to end to suit either port or starboard side fitting. When the LST (3)s were ordered, the LST (2) programme was in full swing, and similar arrangements were made to enable the LSTs to carry the 112 feet (34 m) long LCT5 or LCT6 that were being built in America for the Royal Navy. The LCT needed lifting onto the deck of the ship, being carried on wedge-shaped support blocks; at the time of launching she was set down on the "launch ways" by simply slacking off bolts in the wedge blocks, allowing the launch way to take the weight. To carry out a launch, the LST was simply heeled over about 11 degrees by careful flooding of tanks in the hull. The height of the drop was about 10 ft (3.0 m), and immediately after the launch the craft's engines were started and they were ready for operation. This method was used for moving LCT5s from Britain to the Far East, although there seems to be no reference to LST (3)s being used, most being completed late in or after the war. Even at the end of the war there was a need for more ships able to carry minor landing craft, and two of the LST (3)s then completing were specially fitted to carry LCM (7). These craft, which were 58 ft (18 m) long and weighed about 28 tons, were carried transversely on the upper deck of the ship. They were hoisted on by means of a specially fitted 30-ton derrick; This 30-ton derrick replaced a 15-ton derrick, two of which were the standard fit of the LST (3). The 30-ton derrick was taller and generally more substantial than the 15 ton one. The LCM (7)s were landed on trolleys fitted with hydraulic jacks. These ran on rails down each side of the deck, and were hauled to and fro by means of winches. The stowage was filled from fore to aft as each craft was jacked down onto fixed cradles between the rails. The ships completed to this standard were LST-3043/HMS Messina, and LST-3044/HMS Narvik. While these ships were able to carry LCMs, they were only able to carry out loading and unloading operations under nearly ideal weather conditions, and therefore could not be used for assault operations; they also lacked the facilities to maintain the landing craft (which the Dock Landing Ships provided). The Landing Craft Assault were wooden-hulled vessels plated with armour, 41 ft 6 in (12.65 m) long overall, 10 ft (3.0 m) wide, and displacing 13 tons fully loaded. Draught was 2 ft 3 in (0.69 m), and normal load was 35 troops with 800 lb (360 kg) of equipment. A pair of Scripps marine conversions of Ford V8 engines gave it speeds of 11 knots (20 km/h) unloaded, 8 knots (15 km/h) service speed, 3 knots (5.6 km/h) on one engine. Range was 50–80 miles on 64 gallons. Armament was typically a Bren light machine gun aft; with two Lewis Guns in a port forward position. The LCM (7)s that were carried on the LST (2) were considerably larger, 60 ft 3 in (18.36 m) in length, 16 ft (4.9 m) beam, with a hoisting weight of 28 tons, full load displacement of 63 tons. Beaching draught was 3 ft 8 in (1.12 m), and propulsion was provided by a pair of Hudson Invader petrol engines, later replaced with Grays diesels, both sets providing 290 bhp (220 kW), giving a speed of 9.8 knots (18.1 km/h). The main requirement of the design was to carry a 40-ton Churchill tank or bulldozer at 10 knots (19 km/h). 140 had been completed when the war ended, and some saw service through to the 1970s. Some LST (3)s were converted to LST (A) (A for "assault") by adding stiffening so they could safely carry the heaviest British tanks. Two LST (3)s were converted to command vessels, LST (C): LST 3043 and LST 3044. Post war they became HMS Messina (L112) and HMS Narvik (L114). They were better armed with ten 20 mm Oerlikons and four 40 mm Bofors. 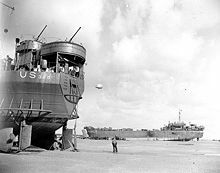 Two LST (3)s were converted during building into Headquarters command ships LST (Q). These were L3012, which became L3101 (and later HMS Ben Nevis) and LST 3013, which became LST 3102, and then HMS Ben Lomond. They acted as LST "mother ships", similar in most aspects to American ships based on the LST (2) hull. They had two Quonset huts erected on the main deck to accommodate 40 officers. Berths on the tank deck berthed an extra 196 men. A bake shop and 16 refrigeration boxes for fresh provisions augmented the facilities normally provided for the crew. Four extra distilling units were added, and the ballast tanks were converted for the storage of fresh water. At the Armor Training School in Ft. Knox, Kentucky, buildings were erected as exact mock-ups of an LST. Tank crews in training learned how to maneuver their vehicles onto, in and from an LST with these facilities. One of these buildings has been preserved at Ft. Knox for historic reasons and can still be seen. From their combat début in the Solomon Islands in June 1943 until the end of the hostilities in August 1945, the LSTs performed a vital service in World War II. They participated in the invasions of Sicily (Operation Husky), Italy, Normandy, and southern France in the European Theater and were an essential element in the island-hopping campaigns in the Pacific that culminated in the liberation of the Philippines and the capture of Iwo Jima and Okinawa. Despite the large numbers produced, LSTs were a scarce commodity and Churchill describes the difficulty in retaining sufficient LSTs in the Mediterranean for amphibious work in Italy, and later the logistics of moving large numbers to the eastern theatres, while still supplying the large armies in Europe. The LST proved to be a remarkably versatile ship. A number of them were converted to become landing craft repair ships (ARL). In this design, the bow ramp and doors were removed, and the bow was sealed. Derricks, booms, and winches were added to haul damaged landing craft on board for repairs, and blacksmith, machine, and electrical workshops were provided on the main deck and tank deck. LSTs putting cargo ashore on one of the invasion beaches, at low tide during the first days of the Invasion of Normandy in June, 1944. Barrage balloons are overhead and a US Army "half-track" convoy is forming up on the beach. Thirty-eight LSTs were converted to serve as small hospital ships and designated LSTH. 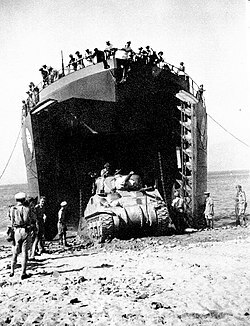 They supplemented the many standard LSTs, which removed casualties from the beach after landing tanks and vehicles. LSTs had brought 41,035 wounded men back across the English Channel from Normandy by D-Day+114 (28 September 1944). Other LSTs, provided with extra cranes and handling gear, were used exclusively for replenishing ammunition. They possessed a special advantage in this role, as their size permitted two or three LSTs to go simultaneously alongside an anchored battleship or cruiser to accomplish replenishment more rapidly than standard ammunition ships. USS LST-906, with US Army Air Force L-4 Grasshopper on her flight deck being prepared for take-off. 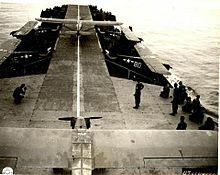 Note additional L-4 type aircraft stowed alongside the deck. Three LST (2) were converted into British "Fighter Direction Tenders" (FDT), swapping their landing craft for Motor Launches and outfitted with AMES Type 11 and Type 15 fighter control radar to provide Ground-controlled interception (GCI) coverage for air defence of the D-Day landing areas. Of these ships, HMS FDT 216 was stationed off Omaha and Utah beaches, HMS FDT 217 was allocated Sword, Juno, and Gold beaches. HMS FDT 13 was used for coverage of the overall main shipping channel. In the period 6 June to 26 June Allied fighters controlled by the FDTs resulted in the destruction of 52 enemy aircraft by day, and 24 enemy aircraft by night. In the latter stages of World War II, some LSTs were fitted with flight decks that could launch small observation planes during amphibious operations. These were USS LST-16, USS LST-337, USS LST-386, USS LST-525, LST-776, and USS LST-906. Two others (USS LST-393 and USS LST-776) were fitted with the Brodie System for take off and landing. It has been estimated that, in the combined fleets assembled for the war on Japan, the tonnage of landing ships, excluding landing craft, would have exceeded five million tons and nearly all built within four years. Throughout the war, LSTs demonstrated a remarkable capacity to absorb punishment and survive. Despite the sobriquets "Large Slow Target" and "Large Stationary Target," which were applied to them by irreverent crew members, the LSTs suffered few losses in proportion to their number and the scope of their operations. Their brilliantly conceived structural arrangement provided unusual strength and buoyancy; HMS LST 3002 was struck and holed in a post-war collision with a Victory ship and survived. Although the LST was considered a valuable target by the enemy, only 26 were lost due to enemy action, and a mere 13 were the victims of weather, reef, or accident. A total of 1,152 LSTs were contracted for in the great naval building program of World War II, but 101 were cancelled in the fall of 1942 because of shifting construction priorities. Of 1,051 actually constructed, 113 LSTs were transferred to Britain under the terms of Lend-Lease, and four more were turned over to the Greek Navy. Conversions to other ship types with different hull designations accounted for 116. The end of World War II left the Navy with a huge inventory of amphibious ships. Hundreds of these were scrapped or sunk, and most of the remaining ships were put in "mothballs" to be preserved for the future. Additionally, many of the LSTs were demilitarized and sold to the private sector, along with thousands of other transport ships, contributing to a major downturn in shipbuilding in the United States following the war. Many LSTs were used as targets in aquatic nuclear testing after the war, being readily available and serving no apparent military applications. World War II era LSTs have become somewhat ubiquitous, and have found a number of novel commercial uses, including operating as small freighters, ferries, and dredges. Consequently, construction of LSTs in the immediate post-war years was modest. LST-1153 and LST-1154, commissioned respectively in 1947 and 1949, were the only steam-driven LSTs ever built by the Navy. They provided improved berthing arrangements and a greater cargo capacity than their predecessors. The success of the amphibious assault at Inchon during the Korean War showed the utility of LSTs once again. This was in contrast with the earlier opinion expressed by many military authorities that the advent of the atomic bomb had relegated amphibious landings to a thing of the past. During the Korean War a number of LSTs were converted to transport the much needed, but slow and short range LSU from the United States to the Korean theater of war using the piggy-back method. After arrival the LSU was slid off sideways from the LST. Additionally, LSTs were used for transport in the building of an Air Force base at Thule, Greenland during the Korean War. Fifteen LSTs of what were later to be known as the Terrebonne Parish-class were constructed in the early 1950s. These new LSTs were 56 feet (17 m) longer and were equipped with four, rather than two, diesel engines, which increased their speed to 15 knots (28 km/h). Three-inch 50-caliber twin mounts replaced the old twin 40-millimeter guns, and controllable pitch propellers improved the ship's backing power. On 1 July 1955, county or, in the case of Louisiana, parish names were assigned to many LSTs, which up to then had borne only a letter-number hull designation. In the late 1950s, seven LSTs of the De Soto County-class were constructed. These were an improved version over earlier LSTs, with a high degree of habitability for the crew and embarked troops. Considered the "ultimate" design attainable with the traditional LST bow door configuration, they were capable of 17.5 knots (32.4 km/h). In 1946 a brand new concept of transport was developed in the UK. It was during World War II that a few experienced men recognised the great potential of landing ships and craft. The idea was simple; if it was possible to drive tanks, guns and lorries directly onto a ship and then drive them off at the other end directly onto a beach, then theoretically the same landing craft could be used to carry out the same operation in the civilian commercial market, providing there were reasonable port facilities. From this idea grew the worldwide roll-on/roll-off ferry industry of today. In the period between the wars Lt. Colonel Frank Bustard formed the Atlantic Steam Navigation Company, with a view to cheap transatlantic travel. This never materialised, but during the war he observed trials on Brighton Sands of an LST in 1943 when its peacetime capabilities were obvious. The chartered vessels had to be adapted for their new role. First the accommodation on board had to be improved, and alterations in the engine and boiler rooms had also to be made. Modified funnels and navigational aids had also to be provided before they could enter service. On the morning of 11 September 1946 the first voyage of the Atlantic Steam Navigation Company took place when the Empire Baltic sailed from Tilbury to Rotterdam with a full load of 64 vehicles for the Dutch Government. On arrival at Waalhaven the vessel beached using the method employed during wartime landings, being held by a stern anchor. The vessel stayed on the beach overnight, returning at 08:00 the next morning. This leisurely pace of work was followed for the first few voyages, the beach being employed possibly due to normal port facilities being unavailable due to wartime damage. Following the Rotterdam maiden voyage, ASN used their new vessels to transfer thousands of vehicles for the Army from Tilbury to Hamburg, later moved to Antwerp in 1955. The original three LSTs were joined in 1948 by another vessel, LST 3041, renamed Empire Doric, after the ASN were able to convince commercial operators to support the new route between Preston and the Northern Ireland port of Larne. Originally Liverpool was chosen, but opposition from other operators led to a move to Preston in Lancashire. However, special port facilities were constructed at both Preston and Larne before the new route could be opened – a wartime-built end loading ramp built by engineers during World War II at Preston, and a floating pontoon from a Mulberry harbour connected via a bridge to the quay at Larne. The first sailing of this new route was on 21 May 1948 by Empire Cedric. After the inaugural sailing Empire Cedric continued on the Northern Ireland service, offering initially a twice-weekly service. Empire Cedric was the first vessel of the ASN fleet to hold a Passenger Certificate, and was allowed to carry fifty passengers. Thus Empire Cedric became the first vessel in the world to operate as a commercial/passenger roll-on/roll-off ferry, and the ASN became the first commercial company to offer this type of service. Some of the first cargo on this service were two lorry-loads of 65 gas cookers each on behalf of Messrs Moffats of Blackburn, believed to be the first commercial vehicles carried in this way as freight. The Preston—Larne service continued to expand, so much so that in 1950 the service was expanded to include a service to Belfast. This service opened in 1950 and sailings out of Preston were soon increased to six or seven a week to either Belfast or Larne. In 1954, the British Transport Commission (BTC) took over the ASN under the Labour Government's nationalization policy. In 1955 another two LSTs where chartered into the existing fleet, Empire Cymric and Empire Nordic, bringing the fleet strength to seven. The Hamburg service was terminated in 1955, and a new service was opened between Antwerp and Tilbury. The fleet of seven ships was to be split up with the usual three ships based at Tilbury and the others maintaining the Preston to Northern Ireland service. During late 1956, the entire fleet of ASN were taken over for use in the Mediterranean during the Suez Crisis, and the drive on/drive off services were not re-established until January 1957. At this point ASN were made responsible for the management of twelve Admiralty LST (3)s brought out of reserve as a result of the Suez Crisis too late to see service. A major task at the end of World War II was the redistribution of stores and equipment worldwide. Due to the scarcity and expense of merchant shipping it was decided in 1946 that the Royal Army Service Corps civilian fleet should take over seven LSTs from the Royal Navy. These were named after distinguished corps officers: Evan Gibb, Charles Macleod, Maxwell Brander, Snowden Smith, Humfrey Gale, Reginald Kerr, and Fredrick Glover. The LSTs needed to comply with Board of Trade regulations, and to be brought up to merchant navy standards, which involved lengthy alterations including extra accommodation. On completion, five vessels sailed for the Middle East, and two for the Far East. During the evacuation of Palestine, Humfrey Gale and Evan Gibb made fifteen voyages each between Haifa and Port Said lifting between them 26,000 tons of vehicles and stores. Similar work was done worldwide until 1952 when the ships were handed over to the Atlantic Steam Navigation Company, and subsequently in 1961 to the British-India Steam Navigation Company, tasked by the War Office directly, RASC having no further concern with their administration. The rapid increase in the use of helicopters in the Royal Navy in the late 1950s and 1960s required an increase in the training and support facilities ashore and afloat. Operational training for aircrew was carried out by naval air stations at Portland and Culdrose. The scrapping of some carriers and conversion of others to commando carriers in the mid-1950s left a shortage of suitable decks. This led to the ordering of the RFA Engadine in 1964; however she would not be available till 1967. In the meantime it was decided to convert LST 3027 to serve as an interim training ship. This work was carried out at Devonport Dockyard in 1964. The deck forward of the cargo hatch was cleared of all obstructions, and strengthened for helicopter use. A small deckhouse used to support the gun emplacements was retained, although no guns were fitted, and it was used by the Flight Deck Officer as a helicopter control position. Below deck, two 10,000 gallon aviation fuel tanks were installed at the fore end of the tank deck, and refuelling positions provided at the fore end of the flight deck. The tanks were sealed off by a bulkhead and the rest of the space used for stores, workshops and accommodation. Finally the bow doors were sealed, as they would no longer be needed. The flight deck was large enough for two Westland Wessex helicopters with rotors turning, or six could be parked with rotors folded. Renamed HMS Lofoten she proved extremely useful in service, and many lessons were learned that would be incorporated into Engadine. USS LST-472 sank after a kamikaze attack off Mindoro Island, Philippines on 21 December 1944. HM LST-422, while on Lend-Leased to Great Britain, sank after hitting a mine off Anzio, Italy. USS LST-480 sank after an explosion at Pearl Harbor on 21 May 1944. Wreck of LST-480 can still be seen in the West Loch. USS LST-359 while under tow by a type V tugboat, Farallon, she was hit by a torpedo and sank after breaking in two off Spain. Two crewmen were lost. USS LST-282 sank on 15 August 1944, by German glider bomb off of St. Raphael, Southern France. USS LST-314 sank on 9 June 1944, by a torpedo off the coast of Normandy. USS LST-6 sank on 17 November 1944, after hitting a mine on a trip from Rouen, France, to Portland, England. USS LST-348 sank on 20 February 1944 after she was hit by a torpedo from U-410, about 22 miles from Gaeta, Italy. USS LST-467 was sunk in 1979, near the U.S. Virgin Islands to be used as an artificial reef upright and intact. She saw service in the Pacific War then was used as interisland freighter. USS LST-471 sank in a storm in 1948, she was being towed to a scrap yard. She sank off the coast of the North Carolina outer banks. She is under 15 feet deep, near the beach in Rodanthe, North Carolina. USS LST-80 sank 20 March 1945, after hitting two mines in English Channel near Ostend, Belgium. USS LST-178, damaged 24 February 1945, after hitting a mine while traveling from Patras, Greece to Corfu. She was loaded with Army personnel and vehicles. She remained afloat and steamed back to Patras for repairs. In 1946 she was handed over to Egypt, only to be sunk by a British air strike during the Suez crisis on 1 November 1956. USS LST-305 sank 20 February 1944, after being hit by torpedo from U-boat U-230 near Shingle, Anzio, Italy. USS LST-362 sank 2 March 1944, by torpedo from U-boat U-744 in Biscay Bay area. USS LST-364 sank 22 February 1945, after being torpedoed by two-man mini U-boat off Ramsgate, England. USS LST-407 damaged 24 April 1944, by a storm in the Mediterranean, beached off Baia, Italy, not repaired. HM LST-411 sank 20 February 1944, after hitting a mine or being torpedoed on trip from Maddalena to Bastia, Sardinia. HM LST-414 sank 15 August 1943, after being torpedoed by aircraft off Cani Rocks, Tunisia. HM LST-418 sank 16 February 1944, after hitting mine near Anzio, Italy. HM LST-420 sank 7 November 1944, after hitting a mine off Ostend. USS LST-447 Sank 7 April 1945 after a kamikaze attack off Okinawa. USS LST-448 damaged by dive bombers off Vella Lavella, Solomons, on 1 October, suffering some casualties, sank while under tow by tug Bobolink on 5 October, south of Vella Lavella. USS LST-460 sank by enemy aircraft attack on 21 December 1944, off Mindoro, Philippines. USS LST-167 on 25 September 1943, while unloading at Ruravai Beach was struck by 2 enemy bombs and destroyed by fires and explosions. After being towed to Rendova, the ship was evaluated and declared a total loss. USS LST-342 was struck by a Japanese torpedo off the Solomon Islands on 18 July 1943, from the Japanese submarine Ro-106. An explosion broke the ship into two, the stern sank immediately. The bow remained afloat and was towed to Purvis Bay (Tokyo Bay) off Florida Island so that equipment in the bow could be salvaged. USS LST-353, on 21 May 1944, sank after an internal explosion while moored in West Loch at Pearl Harbor, Hawaii. The explosion sank five other LSTs: LST-43, LST-69, LST-179, and LST-480. Two others LST were damaged in the explosion. The explosion killed 163 sailors and wounded 396. USS LST-507 in Lyme Bay, in a convoy during Exercise Tiger, she was attacked by a group of German E-boats. LST-507 was hit by a torpedo, she partially floated but sank later. Killed were 424 US army and navy personnel. Two other LSTs were hit that day. USS LST-738 was attacked on 15 December 1944, while operating in support of the landings at Mindoro. A group of about ten Mitsubishi A6M 'Zeke', Nakajima Ki-44 'Tojo' and Ki-43 'Oscar' and Nakajima B5N 'Kate' attacked LST-738's Task Unit. A plane crashed to the port of LST-738. Damage control parties worked on fighting fires but the damage was too great. The head officer ordered an abandon ship. Explosions injured some of the crew. She was abandoned as she burned. The next morning she was sunk by destroyer USS Hall (DD-583) at 12°19′N 121°05′E﻿ / ﻿12.317°N 121.083°E﻿ / 12.317; 121.083﻿ (wreck of USS LST-738)Coordinates: 12°19′N 121°05′E﻿ / ﻿12.317°N 121.083°E﻿ / 12.317; 121.083﻿ (wreck of USS LST-738). USS LST-749 steaming to Mindoro, Philippines, in the Sulu Sea, she was hit by a kamikaze plane on 21 December 1944, into the bridge. She foundered, due to fear of an explosion she was abandoned. Survivors were rescued by the destroyer USS Converse (DD-509). USS LST-906 on 18 October 1944, while anchored at Leghorn, Italy, a storm ran her aground. On 6 December a storm caused further damage to the still-grounded ship. HMS Stalker, previously LST-3515, survived until 2010 at what was formerly Pounds scrapyard at the northern end of Portsea Island, Hampshire. USS LST-849, South Korean Navy Wi Bong renamed LST-676 1958-2006, was commissioned in 1945 and was an active ship until 2006. She first served in the Okinawa campaign in May–June 1945. She earned one battle star for her service in WWII. She was transferred to the South Korean navy in 1958 and served there until 2006. She was used to transport thousands of soldiers and their equipment from South Korea to South Vietnam during the Vietnam War. In 2007, she was decommissioned and sold to the city of Gunsan, South Korea for display in a maritime museum in a deal with the navy. The ship is in great condition and displays life on board the LST when she was in service as well as other historical displays. USS LST-325, Hellenic Navy RHS Syros (L-144) 1964–1999, is one of the last operating survivors of World War II. It is currently home ported at Evansville, Indiana at the USS LST Memorial museum. The ship is kept in navigable shape and makes cruises every year for 2 – 4 weeks. In 2010, participated in a cruise from Evansville, Indiana to Pittsburgh, Pennsylvania for the Amphibious Reunion in Pittsburgh from September 1–7. Upon completion of the reunion, the ship sailed from Pittsburgh to Marietta, Ohio, to take part in the Sternwheel Festival. USS LST-510 participated in the Invasion of Normandy and has operated as a ferry (renamed MV Cape Henlopen) in New England for almost 30 years. She currently operates between New London, Connecticut and Orient Point, on the East End of Long Island, New York. USS LST-393, which participated in the landings on Sicily at Salerno, and the Invasion of Normandy is now located in Muskegon, Michigan as a museum and undergoing restoration. USS Maricopa County (LST-938), had been transferred to the Republic of Vietnam Navy, and after the Fall of Saigon was captured by North Vietnamese forces. As of 2003[update], she is active and in commission with the Vietnamese People's Navy as the Tran Khanh Du. The Philippine Navy received 20+ units of the LST Mk.2 starting in the late 1940s, and still have 7 units on their active list as of 2010. This includes BRP Laguna (LT-501) (ex-USS LST-230), BRP Zamboanga del Sur (LT-86) ex-USS Marion County (LST-975), BRP Kalinga Apayao (LT-516) (ex-USS Garrett County (LST-786) and BRP Benguet (LT-507) (ex-USS Daviess County (LST-692). The Philippine Navy also has the BRP Sierra Madre (LT-57) (ex-USS Harnett County) permanently beached on the Second Thomas Shoal. The ship serves as an advance outpost, and is currently at the center of a territorial dispute between China and the Philippines. The USS Frederick (LST-1184) at sea. Today's Newport-class ships can debark amphibious vehicles from their stern gates. The commissioning of the Newport-class in 1969 marked the introduction of an entirely new concept in the design of LSTs. She was the first of a new class of 20 LSTs capable of steaming at a sustained speed of 20 knots (37 km/h). To obtain that speed, the traditional blunt bow doors of the LST were replaced by a pointed ship bow. Unloading is accomplished through the use of a 112-foot (34 m) ramp operated over the bow and supported by twin derrick arms. A stern gate to the tank deck permits unloading of LVTs into the water or the unloading of other vehicles into a landing craft utility (LCU), onto a pier, or directly into the water. Capable of operating with high-speed amphibious squadrons consisting of LHAs, LPDs, and LSDs, the Newport-class LST can transport tanks, other heavy vehicles, and engineering equipment that cannot readily be landed by helicopters or landing craft. The Newport type has been removed from the U.S. Navy, and Spanish Navy, Chile, Australia, and Malaysia but serves on in the navies of Brazil, Mexico, Morocco, Taiwan, in a modified form and soon with Peru. Elsewhere, over 100 Polish Polnocny-class landing ships were produced from 1967 to 2002. The Indian Navy maintains a fleet of seven Polnocny-class LSTs and LCUs known collectively as the Kumbhir Class. Jonah's Cathedral by R. D. Wall, is a novel of the Vietnam War based on the author's experiences while serving on an LST in the Mekong Delta in 1966. The book, #1 in the Jonah Wynchester Series, follows the exploits of U.S. Navy Gunner's Mate Jonah Wynchester from the time he reports aboard his new assignment, the LST USS Winchester County, at the Navy Amphibious Base in Little Creek, Virginia on New Year's Day 1966 through the time the ship departs for Vietnam. The "Cathedral" refers to the nickname the crew have given the ship, a decrepit, run-down LST in the ready reserve fleet, that is suddenly re-activated and fully manned for the rapidly expanding need for LSTs in the Vietnam theater. Book #2, "Mekong Covenant" follows the ship across the Pacific into the deadly brown waters of the Mekong Delta. The Ninety and Nine by William Brinkley, author of Don't Go Near the Water, portrays an LST running supplies to Anzio during World War II. The title refers to the ship's company of ninety enlisted men and nine officers. The book opens with a quotation attributed to Winston Churchill – "The destinies of two great empires ... seemed to be tied by some god-damned things called LST's." In the biography Man In Motion: Michigan's Legendary Senate Majority Leader, Emil Lockwood by Stanley C. Fedewa and Marilyn H. Fedewa, Lockwood colorfully describes his World War II service aboard LST-478. "We were always in the thick of it," Emil said, "because it was our job on the LSTs to carry personnel-operated tanks, artillery, supplies—anything, you name it—into the heart of a war zone." The novel Warm Bodies by Donald R. Morris portrays life on an LST in the 1950s. The title refers to the use of any available body in port during overhaul for any duty necessary. "A Warm Body is man with at least one arm and two fingers who can pick up something when he is told to." Although a work of fiction, the novel is based on Morris' experience as an officer aboard an LST. Atlantic Fury Hammond Innes's 1962 adventure novel centers around the hasty late-season evacuation, on LSTs, of equipment and personnel from a military radar station on an island called Laerg (based on Hirta, in the St. Kilda Archipelago, about 40 miles west of Scotland's Outer Hebrides), while a severe storm bears down. The author details the vulnerabilities of the LSTs in heavy seas and shifting winds, and the difficulties of landing and disembarking from the small rugged island. ^ Colton, Tim (12 April 2008). "S-Type Special-Purpose Ships". Shipbuilding History.com. Retrieved 9 October 2017. ^ Gerhardt, Frank A. "Cost of War-Built Vessels, From Inception, From October 25, 1936 to June 30, 1946" (PDF). United States Maritime Commission 1936 Thru 1950. Retrieved 9 October 2017. ^ Budge, Kent G. "LST Class, Allied Landing Ships". The Pacific War Online Encyclopedia. Retrieved 9 October 2017. ^ a b c d e f Lenton & Colledge (1968), p. 577. ^ Bishop, Chris (2014). The Encyclopedia of Weapons of WWII: The Comprehensive Guide. London, UK: Amber Books. p. 532. ISBN 978-1-78274-167-1. ^ Brown (2000), pp. 142–143. ^ a b Rottman (2005), p. 6. ^ a b Brown (2000), p. 143. ^ Niedermair (1982), p. 58. ^ a b Niedermair (1982), p. 59. ^ "The LST Building at Fort Knox". generalpatton.org. 2008. Retrieved 19 July 2012. ^ Wyckoff (1982), p. 51. ^ Colton, Tim (15 October 2010). "Missouri Valley Bridge, Evansville IN". Shipbuilding History. Retrieved 16 November 2015. ^ "Chapter XVII : Normandy". The U.S. Navy Medical Dept at War, 1941–1945. Washington, D.C.: Naval History and Heritage Command. pp. 728–732. Retrieved 19 July 2012. ^ Rottman (2005), p. 47. ^ Macaulay, Horace R. (2000). "Ground Controlled Interception Radars in Operation Neptune/Overlord: "The Allied Invasion of France" June, 1944" (PDF). Canadian Radar History Project. Retrieved 16 November 2015. ^ "Flight Strip makes a flattop out of an Invasion Craft". Popular Mechanics. 82 (6): 64. December 1944. Retrieved 16 November 2015. ^ "LSU rides big brother to work". Popular Mechanics. 96 (3): 94–95. September 1951. Retrieved 16 November 2015. ^ "Tank Landing Ship LST-472". Navsource.org. Retrieved 9 October 2017. ^ Cohen, Phil. "The Sinking of the LST-422". dvrbs.com. Retrieved 9 October 2017. ^ "USS Arizona Memorial: Submerged Cultural Resources Study (Chapter 2)". National Park Service. Retrieved 9 October 2017. ^ Helgason, Guðmundur. "USS LST-359 (American Landing ship) - Ships hit by German U-boats during WWII". Uboat.net. Retrieved 9 October 2017. ^ "LST 282 Sunk by German Glider Bomb". Landingship.com. Retrieved 9 October 2017. ^ "Tank Landing Ship LST-314". Navsource.org. Retrieved 9 October 2017. ^ "LST-523". wrecksite.eu. Retrieved 9 October 2017. ^ "Tank Landing Ship LST-6". Navsource.org. Retrieved 9 October 2017. ^ Helgason, Guðmundur. "USS LST-348 (American Landing ship) - Ships hit by German U-boats during WWII". Uboat.net. Retrieved 9 October 2017. ^ Lauterborn, Dave (19 February 2008). "U.S. Virgin Islands: Lessons In Downtime". scubadiving.com. Retrieved 9 October 2017. ^ "Tank Landing Ship LST-471". Navsource.org. Retrieved 9 October 2017. ^ "Tank Landing Ship LST-79". Navsource.org. Retrieved 9 October 2017. ^ "Tank Landing Ship LST-80". Navsource.org. Retrieved 9 October 2017. ^ "Tank Landing Ship LST-178". Navsource.org. Retrieved 9 October 2017. ^ "Tank Landing Ship LST-305". Navsource.org. Retrieved 9 October 2017. ^ "Tank Landing Ship LST-362". Navsource.org. Retrieved 9 October 2017. ^ "Tank Landing Ship LST-364". Navsource.org. Retrieved 9 October 2017. ^ "Tank Landing Ship LST-407". Navsource.org. Retrieved 9 October 2017. ^ "Tank Landing Ship LST-411". Navsource.org. Retrieved 9 October 2017. ^ "Tank Landing Ship LST-414". Navsource.org. Retrieved 9 October 2017. ^ "Tank Landing Ship LST-418". Navsource.org. Retrieved 9 October 2017. ^ Helgason, Guðmundur. "HMS LST 420 (LST 420) of the Royal Navy - British Tank landing ship of the LST (Mk 2) class - Allied Warships of WWII". uboat.net. Retrieved 9 October 2017. ^ "Tank Landing Ship LST-429". Navsource.org. Retrieved 9 October 2017. ^ "LST-167" (PDF). United States Coast Guard. ^ "LST-342". Dictionary of American Naval Fighting Ships. Navy Department, Naval History and Heritage Command. 2004. Retrieved 8 April 2017. ^ Photo gallery of USS LST-342 at NavSource Naval History. Retrieved 12 July 2012. ^ "West Loch Disaster". National Park Service. Archived from the original on 3 December 2009. ^ Pariolo, Garry P. "USS LST-388 callsign NCZY". NavSource Online. Retrieved 24 March 2018. ^ "Operation Tiger". Combined Ops.com. Retrieved 15 August 2008. ^ "Oral Histories - Exercise Tiger, 28 April 1944 (provided by LT Eugene E. Eckstam, medical officer on USS LST-507)". Naval History and Heritage Command. Archived from the original on 12 June 2009. Retrieved 15 August 2008. ^ a b Cressman, Robert (2000). "Chapter VI: 1944". The official chronology of the U.S. Navy in World War II. Annapolis, Maryland: Naval Institute Press. ISBN 978-1-55750-149-3. OCLC 41977179. Retrieved 2007-12-06. ^ "Jinpo Maritime Theme Park (진포해양테마공원)". VisitKorea. Retrieved 9 October 2017. ^ Bauer, Brad (September 9, 2010). "LST-325 makes way to Marietta". The Parkersburg News and Sentinel. Retrieved July 19, 2012. ^ de Castro, Erik; Ng, Roli (31 March 2014). "Philippine ship dodges China blockade to reach South China Sea outpost". Reuters. Retrieved 19 May 2014. ^ Wingfield-Hayes, Rupert (9 September 2014). "China's island factory (see last few pages for description, photos and video of Sierra Madre)". BBC News. Retrieved 17 September 2014. ^ "Kumbhir Class, LCU (MK-3) Class, LCU (MK-IV) Class - Indian Navy". www.indiannavy.nic.in. ^ (Medium), Landing Ship Tank. "Polnochny Class - Bharat Rakshak :: Indian Navy". www.bharat-rakshak.com. ^ Fedewa, Stanley C; Fedewa, Marilyn H. (2003). Man in motion : Michigan's legendary Senate majority leader, Emil Lockwood. Coral Springs, Florida: Llumina Press. ISBN 978-1-93230-337-7. ^ Morris, Donald R. (1957). Warm Bodies, A Novel. New York: Simon & Schuster. ^ Innes, Hammond (1962). Atlantic Fury. New York: Alfred A. Knopf. * Baker, R. (1983) . Selected Papers on British Warship Design in World War II – From the Transactions of the Royal Institute of Naval Architects. Conways Maritime Press. ISBN 978-0-85177-284-4. Brown, D. K, ed. (1996). The Design and Construction of British Warships 1939–1945, The Official Record. Vol. 3: Amphibious Warfare Vessels and Auxiliaries. Conway Maritime Press. ISBN 978-0-85177-675-0. Cowsill, Miles (1990). By Road Across The Sea – The History of Atlantic Steam Navigation Company. Ferry Publications. ISBN 978-1-871947-07-6. Ladd, J. D. (1976). Assault From The Sea 1939–1945. David & Charles. ISBN 978-0-7153-6937-1. Lenton, H. T. (1971) . Warships of the British and Commonwealth Navies (3rd ed.). Ian Allan Publishing. ISBN 978-0-71100-260-9. Macdermott, Brian (1992). Ships Without Names – The Story of The Royal Navy's Tank Landing Ships in World War Two. Arms & Armour. ISBN 978-1-85409-126-0. Marriott, Leo (1985). Royal Navy Aircraft Carriers 1945–1990. Ian Allan. ISBN 978-0-7110-1561-6. Speller, Ian (2001). The Role of Amphibious warfare in British Defence Policy, 1945–56. Cormorant Security Series. Palgrave. ISBN 978-0-333-80097-3. Wikimedia Commons has media related to Tank landing ships.